Spring is here, sprouts are popping through the cold soil, and despite all human attempts to destroy the earth, life has come again. My special friend, Elizabeth Perikli, and I just flew to the mile high city to celebrate the marriage of Boyd Rice and the lovely Karin Buchbinder. 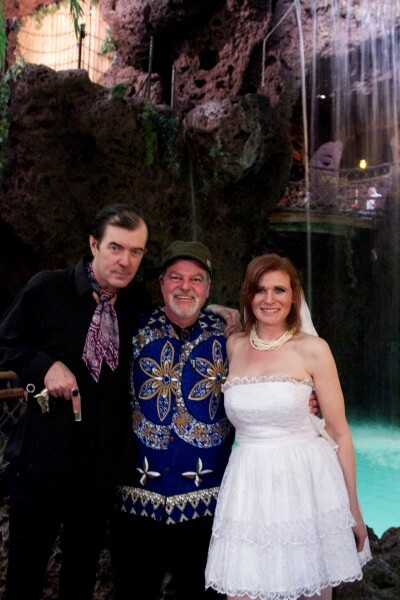 The ceremony took place at the high point of Denver’s weirdness, Casa Bonita, where the black-clad groom held Barnabas Collins’ cane signifying eternal television life, and the bride, all in white, held a floral arrangement signifying promise and togetherness. Behind the photo seen above of Boyd, Karin and yours truly, a young lady climbed the wall and dove into the warm pool, splashing chlorinated water on the newlyweds, whose marriage ceremony was conducted by none other than Little Fyodor in fine Jewfro. With the help of sister Juliet, we have planted the Spring crop at Feral Acres, and if the spirits are right, we will have a new crop of arugula, spinach, beets, onions, lettuce, beans, raspberries, potatoes, garlic and tomatoes. God bless the Vernal Equinox.